The Carrion Crow was originally described by Linnaeus in Systema Naturae (1758) and it still bears its original name of Corvus corone, from Latin Corvus, "Raven" and Greek corone, "crow". 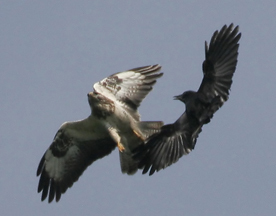 Two subspecies of the genus Corvus have been described in Europe: Corvus corone corone (entirely black, occurring in Wesyern Europe) and Corvus corone cornix ("Hooded Crow", with contrasting grey back and underbody, occurring in Northern and Eastern Europe). Fertile hybrids occur along the boundary between these two forms, in Central Europe. The plumage of the Carrion Crow is entirely black. The bill, legs and feet are also black. Males and females are similar (they slightly differ in size, with males slightly larger than females). 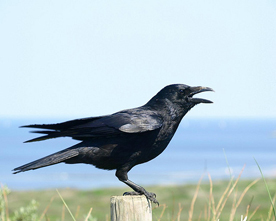 Crows can be distinguished from the Common Ravens by their size (48-52 cm in length) but there is frequent confusion with the Rooks. The beak of the Crow is stouter and in consequence looks shorter, and whereas in the adult Rook the nostrils are bare, those of the Crow are covered at all ages with bristle-like feathers. believed to have taken place during the last ice age, with the closely allied Hooded Crow (now given species status) filling the gap between. Favourite habitats include agricultural landscapes with grassland, arable fields, dung-rich pastures, hayfields, cereal fields, areas by water, and rubbish tips. Carrion crows are omnivorous. They principally live off invertebrates and cereal grains, but they also eat small vertebrates, eggs and carrions according to local availability. The bulky stick nest is usually placed in a tall tree, but cliff ledges, old buildings and pylons may be used as well. Nests are also occasionally placed on or near the ground. The four to six brown-speckled blue or greenish eggs are incubated for 17-19 days by the female alone. The young fledge after 32-36 days. For further details on Carrion crows see. Cramp, S. & Perrins, C. M. 1994. The Birds of the Western Paleartic. Vol VIII. Crows to Finches. Oxford: Oxford University Press. Madge, R. D. & Burn, H. 1999. Crows and Jays. London: Christpher Helm, A. Black, C.
Molina, V. & Baglione, V. 2003. Corneja negra. In: Atlas de las Aves Reproductoras de España, pp. 552-553. Madrid: Ministerio de Medio Ambiente.